As Abbot of Chanmyay Yeikthat and Hmawbi MeditationCenter, Sayadaw tutors some 200 foreign and 2000 Burmese students annually. He has about 30 Burmese and 20 foreign resident monks under his care at the two centers. Besides his administrative duties as Abbot, Chanmyay Sayadaw delivers innumerable Dhamma talks and lectures both in English and Burmese in Yangon and throughoutMyanmar. He conducts a full slate of interviews as well as question and answer sessions for foreign and local yogis at both centers. 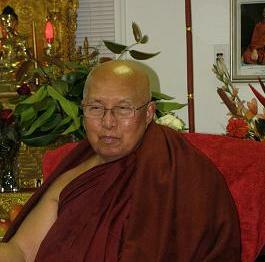 He is a Master Teacher of bothvipassana(insight meditation) andmetta(loving-kindness) meditation practices. Currently he teaches a practice that combines both metta and vipassana meditation techniques at his retreats and centers. "Having meditated for many years in different Buddhist traditions, I met Sayadaw at a retreat inAustraliain 1991... Major changes happened in my life. The first and most obvious was the fact that I felt that it was only then and there that I really started to meditate. His instructions were clear, precise and short. For me it was like really getting into the center... though at the time I had no words to describe what this "center" was..."
"My first experience of learning and practicing with Sayadaw left a very deep impression. From the very first interview, I knew without a doubt that I had found my teacher. The recognition was indisputable. With Sayadaw, I had a sense of being coached and guided based on my actual experience, without presumption on what a yogi that has only attended 3 short retreats was capable of or limited to. ... my practice flourished in a very short period of time. Contrary to "rumors" of Sayadaw's unrelenting and uncompromising strictness and sternness to yogis, I was being guided by one the most compassionate, understanding approachable and skillful teacher. Chanmyay Sayadaw was born on Tuesday, July 24, 1928 in PyinmaVillage, Taung-dwingyi Township, Myanmar. He was the third of nine children. His father, U Phyu Min and mother, Daw Shwe Yee owned a successful rice farm. The young Ahsin Janaka spent carefree childhood years growing up well looked after by his parents. They coached him early on in the fundamentals of Buddhism. His fater was known as a pious man, neither harsh nor lax in his treatment of his children and others. His mother was kindly and supportive to those around her. After his early education atPyinmaCovernmentPrimary Schooland Tawya Beikman Monastery, he ordained as asamanera(novice) at age 15. His preceptor, the Abbot Venerable U Malavamsa gave him the name Shin Janaka. So keen was his interest in the Dhamma that he studied and became fully conversant with all aspects of the Dhamma in the Pali Canon (Tipitaka) especially Gradual Sayings (Anguttara Nikaya) while still a novice. His understanding was so thorough that he tutored other students at the request of his teacher. On October 28, 1947, Shin Janaka received his higher ordination (upasampada) to the Order of Bikkhus, Buddhist Monks, and became Ashin Janaka. His preceptor was the Venerable Sayadaw U Paduma of Tawya Beikman Monastery,Taungdwingyi,Myanmar. Following his ordination, Ashin Janaka enthusiastically continued his advanced studies of Buddhist scriptures under the guidance of several Venerable Sayadaws. Within a few short years he passed his Advanced Grade examinations as well as his Sakya-siha examinations (Vinaya, Sutta, and Abhidhamma). After passing his Lectureship examinations (with distinction), he assumed the post of Lecturer at theMahavisuddhayoneBuddhistUniversity,Mandalayin mid 1952. At this time, he was conferred the very rare title of Abhivamsa by the Pariyatti Sasana Hita Association of Mandalay. To be given this honour one must have attained and demonstrated Doctoral level proficiency in the Pali Canon (Tipitaka), Commentaries (Atthakatha) and Sub-commentaries (Tika) before the age of 27. He was addressed as Ashin Janakabhivamsa from them on. At what was to turn out to be a very auspicious event, Ashin Janakabhivamsa met the Most Venerable Mahasi Sayadaw in 1953 and practiced intensive meditation at the Mahasi Sasana Yeiktha under the Most Venerable's direct guidance. He had been trained from early years in thesamatha(concentration) practice of anapanassati. So, with some degree of skepticism, he diligently practiced vipassana (insight) meditation at Mahasi Sasana Yeiktha for 4 months. He achieved great success of the rising and falling of the abdomen and movement of walking feet as primary objects of meditation. It was important, as well, to be mindful of all phenomena arising and passing away within the body and mind from moment-to-moment. In 1954, Ashin Janakabhivamsa was invited by the State Buddha Sasana Organization to edit the Buddhist Scriptures to be recited at the Sixth Buddhist Council held at Kaba Aye, nearYangon,Myanmar. Ashin Janakabhivamsa went toCeylon(Sri Lanka) for further studies in 1957. He resided at the Mahavissuddharama Monastery inColombofrom 1957 to 1963. He undertook extensive language studies in English, Sanskrit, Hindi and Sinhalese. He also passed his London GCE (A Level). In 1961, the chancellor ofVidyodayaUniversity, a newly establishedBuddhistUniversity, offered Ashin Janakabhivamsa the post of Lecturer of Buddhist philosophy. But due to poor health at that time, he was unable to accept. After performing various duties in Myanmarand studying abroad (Sri Lanka), Ashin Janakabhivamsa eventually ended up becoming one of five principle disciples of the Most Venerable Mahasi Sayadaw. He assisted in preparing many of the Most Venerable's books for publication. In 1967, he became a Meditation Teacher (Nayaka Sayadaw) at the Mahasi Sasana Yeiktha under the instruction of the Most Venerable Mahasi Sayadaw. Ashin Janakabhivamsa assisted The Most Venerable in the duties of pariyatti (scriptural instruction), preparing books on meditation and patipatti (meditation instruction to yogis). At that time, an article appeared in the "World Buddhism" magazine claiming that the "Mahasi method" of practice was in discord with the Scriptures. The article challenged its validity and legitimacy as genuine path to liberation. Ashin Janakabhivamsa wrote such an eloquent and definitive rebuttal to the criticism that it was published consecutively for 15 months in the same magazine. Clearly, his own experience with Mahasi's method weighed greatly in his reply. Any doubt lingering around the efficacy of the method was dispelled. Later, all these articles were compiled and made into a book entitled "Satipathana Vipassana Meditation". It was published by the Buddha Sasana Nuggaha Organization, Thathana Yeiktha,Yangon,Myanmar. The Most Venerable Mahasi Sayadaw's method of vipassana meditation was becoming widely known and sought after beyond the borders ofMyanmar. Asian and Western students were arriving yearly at t heMahasiCenterfor direct instructions and retreats. Shortly before his death, the Most Venerable Mahasi Sayadaw was invited to Europe and theUnited States of America. He undertook some dhammaduta missions betoween 1979 and 1980 to these countries and was ably assisted by Ashin Janakabhivamsa. This sowed the seeds for his own popular dhammaduta missions throughout the world later. In February 1977, Ashin Janakabhivamsa took up residence at his new center,ChanmyayYeikthaMeditationCenter. Several devoted students and lay disciples had donated the land and buildings. As Abbot of the center, he became well known as Chanmyay Sayadaw. In May 1982, U Man Kyint Htan, president of the Christian Council of Kalay Myo invited Chanmyay Sayadaw to deliver sermons on Buddhism. Sayadaw preached to more than 6000 Christians and Buddhists at Kalay Myo over three successive days. Soon after this, U Man Kyint Htan ordained as a temporary monk and practiced meditation under the guidance of Chanmyay Sayadaw. Meanwhile, devotees in Hmawbi andYangonhad enthusiastically arranged a fifteen-acre land donation. This became Sayadaw's Hmawbi forest retreat center. The land is cool and quiet, with many shady fruit trees. It is an ideal and peaceful place for both short and long term intensive practice. Over time, many other Chanmyay Centres were setup, bothMyanmarand internationally. Chanmyay Sayadaw now has centres throughoutMyanmar. BesidesYangonand Hmawbi, there are Chanmyay Centers in Maymyo,Lei Way, Moe Kaung, HinThada and Taung Gyi. Internationally, Chanmyay Centres can be found inCanada(VancouverandCalgary), South Aftica,Thailand,USAandSingapore. As Abbot of Chanmyay Yeikthat andHmawbiMeditationCenter, Sayadaw tutors some 200 foreign and 2000 Burmese students annually. He as about 30 Burmese and 20 foreign resident monks under his care at the two centers. Also, at any given time, 3-5 novices reside inYangonand Hmawbi. His is also an Honorary Professor at theTheravadaBuddhistMissionaryUniversityatYangon,Myanmar. Rounding out his roster of duties, Sayadaw presides over a large number of ordinations for temporary and full time monks throughout the year. Beyond his Dhamma tours with the Most Venerable Mahasi Sayadaw mentioned earlier, Chanmyay Sayadawhas travelled extensively on his own dhammaduta missions. Between 1979 and the present, Saydaw travelled to 28 countries in Asia, Africa, Asutralia, Europe andNorth America. During these travels, he conducts meditation retreats, delivers dhamma talks and generally spreads Dhamma goodwill throughout the world. Several other notable highlights from Chanmyay Sayadaw's extraordinary career should be mentioned. From 1978 to 1980 Sayadaw broadcast a radio series entitled "Attainment of Eternal peace though Right Understanding". The series had a wide listening audience and was later published. In spite of his demanding schedule as Abbot, teacher and dhamma speaker, Sayadaw has managed to write and publish several articles and books, both in English and Burmese. (See Biography). This body of works, which includes some translations, has greatly assisted students' understanding of the Dhamma. In the summer of 1981 and 1982, Sayadaw lectured on vipassana meditation atOxford University,England. During the spring of 1982, Sayadaw also lectured on meditation practice atWesternIllinoisUniversity. While visitingHawaiiin January 1983, he lectured on the application of The Noble eightfold Path to the practice of vipassana meditation at theUniversityofHawaii. During May 1982, Sayadaw gave his historic sermon on "Peace and Happiness" at the request of the Christian Councill of Kalay Myo inMyanmar. The talk was delivered over three consecutive days and attended by more than 6,000 pelple, mostly Christians. It was later published in an unprecedented print unf of 54,000 copies. He also delivered a well received lecture at the London Buddhist Vihara in 1982 on "The Parable of the Log". This was later published and made available on cassette tape. Sayadaw has been conferred many honorable titles throughout his life, most notably, Agga-Maha-Saddhamma Jotikadhaja (Great Noble Teacher of the Shining Dhamma) in 1994 and Agga-Maha-Kammatthanacariya (Great Noble Meditation Master) in 1995. Based on Sayadaw's extensive and tireless devotion to spreading the Dhamma these titles are well deserved. Sayadaw has instructed and guided countless students from all walks of life over the years. It is quite amazing how his appeal, skill and Dhamma have reached across age, gender, race, socio-economic barriers and nationality. Here is a sampling of what a diverse group of students have to say about Sayadaw and his teaching. What amazed me most was the consistent and immense metta, compassion and sympathetic joy that Sayadaw would infallibly exude throughout the duration of my practice with him... For an ardent yet sensitive yogi, these noble qualities were truly precious and invaluable. ... (it was truly) a blessing to have met and practiced with (such a) phenomenal teacher..."
"(Sayadaw has) a massive storehouse of Buddhist scriptural knowledge...and the ability to quote appropriately for the student's needs and situation. He was extremely patient and compassionate with me... and there was never a doubt in my mind about the information and guidance I was given... I had full confidence that he was a masterful teacher." "...The first time I heard the Dhamma as it really is was with Sayadaw... The practice and the Dhamma comes alive in his presence." "One day a Korean monk reported that two days ago at lunch he could not be mindful and note anymore because a pot of REAL Korean soup was served. "It was so delicious" he said, "that I lost all mindfulness." Sayadaw just listened. To our great surprise, Sayadaw told Mimi to prepare the soup again. While Sayadaw is strict, precise, clear and demanding as a teacher to get the best from the yogis... he is very soft and caring and never misses an opportunity to improve outer conditions in even a small way." "Sayadaw repeated stresses the importance of noting the mind and mental states; he says this is the most important thing. The second most important thing is to not all daily activities mindfully, slowing down as much as possible... Every time I see Sayadaw I fee calm and peaceful. His very name "Chanmyay" suits him (it means peaceful)... Imagine how peaceful we are living in the shade of Sayadaw's metta." "The practice of the Four Foundations of Mindfulness and insight meditation is made clear to seeker of truth... Sayadaw's timely and precise advice is very helpful as he understands well the progress of the yogis... Those who are sincere in their practice, know they are on the right path of practice under the guidance of Sayadaw." Spanning a period of more than 60 years as an ordained monk, the career of Chanmyay Sayadaw can be described as far-reaching and illustrious to say the least. By virtue of his own courageous search for Truth and understanding, which includes his "incessant drive" to deliver and promote the Dhamma to others, Sayadaw ranks as one of the leading authorities and teachers from the 20th and 21st centuries. He leads an exemplary life and is tireless in executing his chosen duties. His vast numbers of students bow to the simplicity and affirmative nature of his teaching and style of assistance. It would be almost impossible to assess and count how many lives this Sayadaw from a simple farming background has positively affected. It is an awesome thought, but one student, one Dhamma talk at a time, Chanmyay Sayadaw continues to cast his lot as a profound promoter of peace, loving-kindness and liberation for the sentient beings. Solo Dhammaduta missions to 28 countries in Asia, Africa,Australia, Europe andNorth America, April 1979 to the present. As Abbot of Chanmyay Yeiktha and Hmawbi Meditation Center, Sayadaw tutors some 200 foreign and 2000 Burmese students annually. He as about 30 Burmese and 20 foreign resident monks under his care at the two centers. Also, at any given time, 3-5 novices reside in Yangon and Hmawbi. 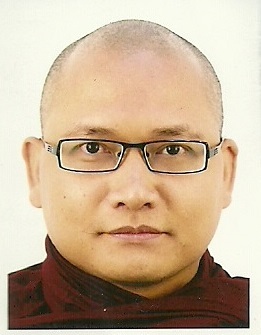 Ven Ashin Wiwekananda was born on 13 February 1974 in Pyinma Village, Taung Twin Gyi Township, Magway District, Myanmar. His parents are U Bo Tay and Daw Mi Khin and he is the sixth son among seven siblings.When he was 11-year old after finishing 4th grade, he ordained as novice monk with Village Monastery (Ywar-Oo-Kyaung) Sayadaw Ven U Sunanda as his preceptor. Under Ven U Sunanda’s guidance, he studied Buddhist scriptures for 2years. Download the form and email to us. To fulfill a need of 24hr meditation centre in Singapore, we are opening our centre on 11 Dec 2011. Anyone who wish to practise meditation, we reserve 2 spacious airconditioned rooms at 2nd level restricting for meditation purpose. We hope that the place will be conducive and no distraction for meditation. Copyright © 2012 chanmyaysin.org | All rights reserved.